Cincinnati Blog: Illegally Placed or Legally Placed Political Signs? 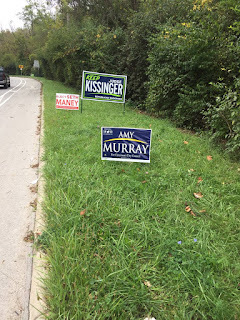 Illegally Placed or Legally Placed Political Signs? Saw this on twitter this morning from Republican City Council candidate Seth Maney. The problem I have are the political signs along the side of the road. If that land is private land, I hope they got permission to do that. If that is public land that is not right and should be illegal and subject to a fine. Hamilton County Republicans won't let it come to a fine. They won't do anything because they protect their own. If this was a Democratic candidate making a clear rookie mistake of publishing a picture of campaign violations, you can be sure it would be fodder for 'PX' in the Enquirer the next issue, including a veiled threat to charge a crime from the GOP county prosecutor. Instead, we'll get silence of this minor issue that goes on (both sides place signs all over the place) every year. It is just galling that a candidate has someone operating the campgin twitter account that green, but other than this tired old blogger, no one will point out that incompetence. Instead, the small band of Republicans will vote for the unknown candidate because he has a Republican Party Endorsement. Hell, the local FOP endorsed the guy with no track record on anything police or public safety related, but ignored a candidate who recently was forced to retire as a police officer because of an injury he received on the job and who has worked very hard for police officers, especially for the family of slain Cincinnati Police Officer Sonny Kim. To make sure people are clear, the real issue is not about the signs. This stuff happens. Campaign volunteers don't know what they are doing and do this all the time. The same person likely placed all three. If it was the land owner, all is well, but likely, since they are placed well so all are seen, it was done by a campaign volunteer with a little bit of knowledge. Some campaigns may even do this intentionally, with full knowledge it is wrong, but everyone on the campaigns turn a blind eye to it, as long as their party is Republican. Instead the issue is that someone tweeted a picture of this. I replied with a question on twitter on this. I probably won't get a response. No seasoned candidate would give two fucks about the signs, unless they could get some good PR about it. It is an indication of a candidate or campaign not prepared. Maney got into this late and I don't know how much organization backing he has, but this incident indicates that they make big mistakes like this. Twitter mistakes run in the party.